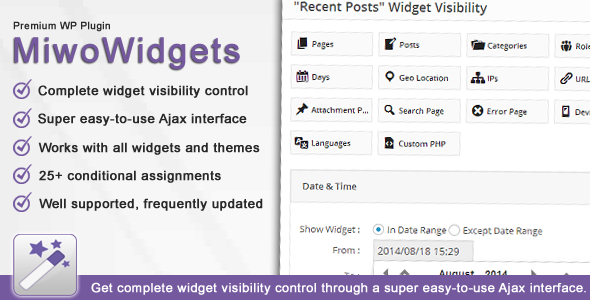 MiwoWidgets is a Widget Visibility Manager plugin that changes the way you can show/hide widgets on your site. With WordPress you can normally assign widgets to be shown to certain sidebars. With MiwoWidgets you have the possibility to assign widgets to just about anything you want. Pages, posts, categories, dates, languages, IPs, URLs, devices, browsers are some of the assignment options.